-No smell and non-toxic, environmental protection, safe for your health. -Superb craftmanship and high quality, durable and practical. -Fix the leather when you want to sew, make your hands free. -Easy to install, just need 1 minute to finish the installation for a use. -The wrench can adjust the tightness up and down, any thickness suit to use. -Suitable for the professions and amateurs. -Perfect for lacing, sewing, or stitching for any other uses requiring that missing third hand. We will give you a 100% refund if you are not completely satisfied with purchase! Please feel free to contact us through Amazon if you have any questions. SAVE YOUR TIME - This leather stitching pony securely holds the leather, the vise section can be positioned so you can sit on the long base section to hold the pony steady while in use. Make your job much easier and faster. 360 DEGREE ROTATION -Products can be adjusted to any angle according to your needs, very flexible. Whether you are a right or left-handed person, the leather tool will meet your needs perfectly. 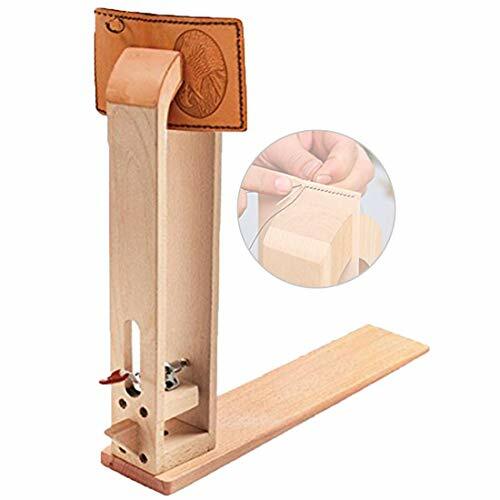 SUPERB CRAFTSMANSHIP- The wood of the leather sewing pony is practical and durable, defromation resistance, streamlined design with a uniform proportion; Rotary smooth screws are not easy to get rust. Stainless steel stretch bar can be adjusted to suit any size of the clamping needs. DIY SEWING EASILY - Everyone want to get unique something, refer to the picture, complete the installation in 1 minute. Use the leather clamp helping you for DIY your belt, bag, leather, wallet, purse, pocketbook, wrapped, polished, upper oil something else freely. AFTER-SALES GUARANTEE: 1 YEAR WARRANTY. We will give you a 100% refund if you are not completely satisfied with purchase! Please feel free to contact us through Amazon if you have any questions. If you have any questions about this product by Erlsig, contact us by completing and submitting the form below. If you are looking for a specif part number, please include it with your message.